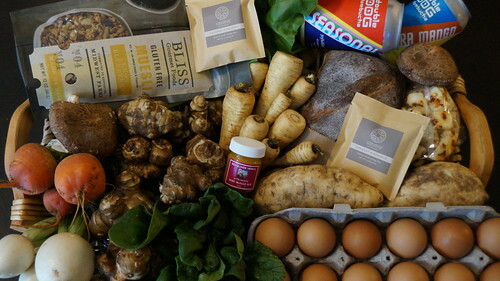 Shopping Basket from the May 19 Mill City Farmers Market - Mill City Farmers Market 2018 - Minneapolis Riverfront Neighborhoods. In the basket this week: Two varieties of Double Dog Kombucha and a jar of Sore Muscle Rub from Red Clover Herbal Apothecary Farm. Bliss Gourmet Foods has a new gluten free muesli called Lemon Blueberry. I'm a sucker for anything lemon, so I couldn't pass that up.